(1) Quantify the effect of row spacing (15 in vs. 30 in) on double-crop soybean yield. Hypothesis: there will be no significant yield difference between double-crop soybeans planted in 15 in rows vs. 30 in rows. (2) Evaluate the effect of interseeded cereal rye-legume cover crop mixtures on wide-row double-crop soybean yield. Hypothesis: there will be no difference in yield between wide-row (30 in) soybean grown with and without interseeded cover crops. (3) Determine the legume species which, in combination with cereal rye in wide-row double-crop soybeans, produces the largest amount of cover crop biomass. Hypothesis: the cereal rye-hairy vetch cover crop treatment will produce the highest levels of biomass of the five cover crop treatments. (4) Quantify nitrogen contribution of cover crop mixtures to corn yield. Hypothesis: corn yields will be the highest for corn planted in the cereal rye-hairy vetch treatment plots. In the mid-Atlantic region, the inclusion of double-crop soybean in wheat-soybean-corn rotations limits legume cover crop adoption due to the shortened window for establishing cover crops after the soybean harvest. Double-crop soybeans are harvested in mid-November; however, legumes must be seeded by early October in this region to ensure establishment and high biomass production. This limitation is problematic because a cereal rye-legume cover crop mixture could provide erosion control in the fall and winter and nitrogen to the following corn crop in the spring. The purpose of this project is to evaluate a novel cover crop interseeder technology, which allows growers to drill cover crops into a standing soybean crop. This practice could transform growers’ ability to integrate legume cover crops into a grain rotation and offset inorganic nitrogen fertilizer needs in the corn phase. However, it would require transition from a narrow-row soybean spacing (7.5 – 15 in) to a wide-row spacing (30 in). Specific objectives of this study include: 1) quantify the effect of row spacing (15 in vs. 30 in) on double-crop soybean yield; 2) evaluate the effect of interseeded cover crops on wide-row double-crop soybean yield and harvestability; 3) determine the legume species which, in combination with cereal rye in wide-row double-crop soybeans, produces the largest amount of cover crop biomass; 4) quantify nitrogen contribution of cover crop mixtures to corn yield; and 5) calculate the economic impact of cover crop inclusion during the double-crop soybean to corn phase. To determine the effect of row spacing on double-crop soybean (Glycine max (L.) Merr.) yield (Objective 1), effect of interseeding cover crops on the double-crop soybean yield (Objective 2) cover crop species biomass growth (Objective 3) and the amount of nitrogen in the mature cover crops the spring after interseeding (Objective 4 ), field trials were initiated in the double-crop soybean phase of a two-year rotation of a wheat/double-crop soybeans-corn rotation and concluded at corn harvest. One set of field trials was started in 2017 and another was started in 2018. In December 2018, I completed the first full round of field trials that was started in 2017. The second full round of field trials will be concluded in October or November 2019, with the partial budget analysis to take place shortly afterwards. Field experiments were conducted at the Beltsville (MD) Agricultural Research Center (BARC; 39.03˚N, 76.93˚W), the University of Maryland Central Maryland Research and Education Center (CM; 39.01˚N, 76.83 ˚W) and at the University of Delaware Carvel Research Farm (UD; 38.64˚N, 75.46 ˚W). One experimental site was established in 2017 at BARC and three experimental sites have been established in the summer of 2018 at BARC, CM and UD. At the BARC field site in 2017-2018, the experiment will take place on a Hammonton loamy sand (coarse-loamy, siliceous, semiactive, mesic Aquic Hapludults). In 2018-2019, the experiment will take place on a Christiana silt loam (fine, kaolinitic, mesic Aquic Hapludults) and a Russett sandy loam (fine-loamy, mixed, semiactive, mesic Aquic Hapludults) complex at BARC and CM, and a Pepperbox loamy sand (loamy, mixed, semiactive, mesic Aquic Arenice Paleudults) at UD. We used a split-plot experimental design with soybean row spacing and interseeded cover crop randomized as the main effect and sidedress N rate as the split-plot. Within the main effect treatment, there was a total of 7 factor levels: two soybean row spacings (38 cm and 76 cm) and five cover crop treatments interseeded into double-crop soybeans on a 76 cm row spacing. These five cover crop treatments included cereal rye (Secale cereal L.) alone and cereal rye mixtures with four legumes: Austrian winter pea (Pisum sativum var. arvense (L.) Poir. ), crimson clover (Trifolium incarnatum L.), red clover (Trifolium pratense L.) and hairy vetch (Vicia villosa (L.) Roth). The species selected were the prominent cover crops used in the mid-Atlantic region and reflect a gradient of shade and cold tolerance. Each field experiment site included six replicates of the seven treatments. The N dose-response split-plot treatment includes six N rates (34, 67, 100, 135, 168 and 225 kg ha-1). This treatment was applied to determine the N fertilizer equivalent of the cover crop treatments and document corn yield potential. All plots received a starter fertilizer rate of 33.6 kg N ha-1 at planting, with the remaining amount of the fertilizer required to reach the treatment quantity (Table 2) applied at side-dress (growth stage V5). To initiate the experiment, double-crop soybean was planted at 72,720 seeds ha-1 in 38 and 76 cm rows following winter wheat harvest. Each double-crop soybean main plot was 6 m wide and 61 m long, except in one field at BARC which was 18 m wide and 37 m long. The split-plots (N sidedress rate) were 3 m wide and 9 m wide. The cover crop mixtures were planted in early September using a no-till drill interseeder. The no-till interseeder equipment sowed three rows of cover crops 25.4 cm apart between each 72 cm soybean row. Cereal rye alone was seeded at 125.5 kg ha-1. 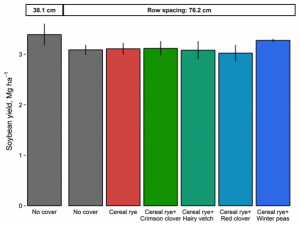 Each cereal rye-legume cover crop mixture included cereal rye at 33.6 kg ha-1 with hairy vetch at 22.4 kg ha -1, crimson clover at 22.4 kg ha -1, red clover at 11.2 kg ha -1 or Austrian winter peas at 78.5 kg ha-1. 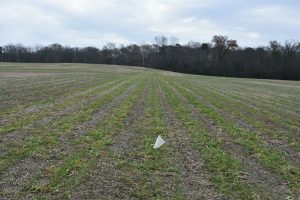 The entire experimental site was treated with glyphosate and 2,4-D to terminate cover crops and control emerged weeds seven to ten days prior to corn planting. Corn was no-till planted at 11,312 seeds ha-1 with 33.6 kg ha-1 of starter N fertilizer. The split-plot N fertilizer treatment was applied four to five weeks after planting at the rates required to reach the split-plot treatments: 34, 67, 100, 135, 168 and 225 kg N ha-1. During the first year of the crop rotation cycle, soybean production metrics were gathered during crop growth and at harvest. Soybean stand counts (emerged seedlings per 6.1 linear meters of a row) were recorded three weeks after emergence at three random locations in each replicate. 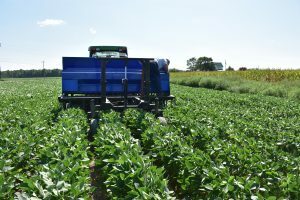 To assess the impact of cover crops on soybean harvest, a subsample of the harvested soybeans were separated into grain and any cover crop plant material that was collected by the combine. Soybean yields between the main effect treatments were measured and compared at harvest. Cover crop growth and biomass were measured 8 weeks after planting and the following spring 4 weeks before termination. The ground cover of the cover crops was assessed at two representative areas in each cover crop main plot using percent ground cover collected via the software application Canopeo (Oklahoma State University, Stillwater, OK) and normalized difference vegetative index (NDVI) collected using a Crop Circle sensor (Holland Scientific, Lincoln, NE). Immediately prior to termination, the aboveground biomass of each cover crop treatment was collected, by species (1 m2 quadrats), by cutting plants at ground level. This biomass was dried, weighed, and analyzed for total carbon and N. Additionally, light transmission readings using a point sensor and light bar sensor (LI-COR BioSciences, Lincoln, NE) were taken three times throughout the cover crop growth period (at interseeding, 4 weeks after interseeding and at soybean harvest) to measure the amount of light available through the soybean canopy. Corn growth and yield was measured in response to (1) cover crop (2) row spacing, and (3) N rate). During the corn phase of the rotation, corn emergence was documented with stand counts 2-3 weeks after emergence (6.1 linear meters). Corn height was assessed immediately prior to side-dress and two weeks after side-dress. The center two rows of each treatment plot were harvested with a small-plot combine to determine corn yield. The economic implications of interseeding cover crops into wide row soybeans will be evaluated with a partial budget analysis. Analysis will include soybean yield, soybean grain price, cover crop seed price, interseeding costs, N costs for corn, corn yield, and corn grain price. Data will be checked for normality and homogeneity of variance and dependent variables transformed with the Box-Cox function in R to assure normal distributions as needed. Data will be tested for interactions among site, year and treatment and pooled across site and year if no interaction is detected. Analysis of variance and mean separation will be conducted using the lsmeans package (Lenth, 2016) and a p-value of 0.05. I will classify cover crop, fertilizer rate, and the interaction thereof as categorical fixed effects. The random effects are cover crop subplot nested within field replicate block. At this stage, I have finished collecting all of the data to analyze the outcomes of Project Objectives 1 and 2. The data for Objectives 3 and 4 will be available in April or May 2019 and the data for Objective 5 will be completely collected for analysis by November 2019. Preliminary analysis of the soybean yields from two site years across the two rows spacing treatments and five different cover crop treatments shows a decrease of about 4 bu ac-1 when row spacing increases from 38 cm to 76 cm. There is little to no change in mean soybean yields across 76 cm wide double-crop soybean rows with different cover crop treatments. The wide row double-crop soybeans interseeded with a mixture of cereal rye and winter pea actually showed a slight increase in soybean yield. This data does not include recently collected soybean yield data from three addition field sites. The cover crop biomass collected from the first round of field trials is graphed below. All of the darker columns are cereal rye biomass weights and the lighter columns are the biomass rom the legumes. The cover crop biomass from three more field sites will be collected and analyzed in a similar matter in spring 2019. 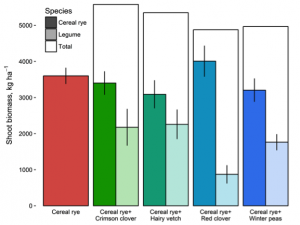 From these preliminary results, it is evident that all of the cover crop mixtures of a legume species planted with cereal rye outperformed the cereal rye monoculture. The nitrogen content of the cover crop biomass collected in the spring of 2018 from the first round of field trials is graphed below. The darker columns represent the nitrogen from just the cereal rye component of the cover crop treatment and the faded columns are from the legume species. From these prelimary results, it is clear that the cereal rye-legume cover crop species all contained much more nitrogen in their biomass than the cereal rye alone. 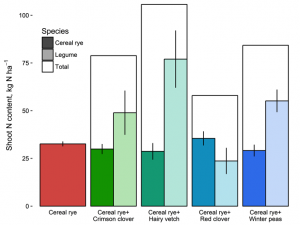 The cereal rye – hairy vetch biomass had the largest amount of nitrogen, with cereal rye-winter pea and cereal rye -crimson clover containing the next highest nitrogen content. Also, the nitrogen content of the cereal rye biomass was relatively consistent across all five cover crop treatments. Also please see photos from soybean harvest and my presentation below. 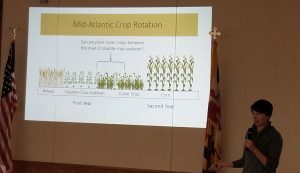 On December 5th, I presented my preliminary results and field trial experiences with farmers and agricultural educators at the Kent Country Harvest Breakfast in Chestertown, MD. Two items for publication are currently in progress: an article for the Maryland Extension website and an article intended for publication in a peer-reviewed research journal. The extension article will be focused on presenting the results and experiences from the two years of field trials conducted so far. The journal article will be the first of two written about this research project and will focus on the outcomes of the first three objectives: identifying the effect of row spacing on double-crop soybean yield, the effect of interseeded cereal rye- legume cover crop mixtures on wide-row double-crop soybean yield and which legume cover crop species will produce the largest amount of biomass in combination with cereal rye. The purpose of this project is to evaluate a novel cover crop interseeder technology, which allows growers to drill cover crops into a standing soybean crop. This practice could transform growers’ ability to integrate legume cover crops into a grain rotation and offset inorganic nitrogen fertilizer needs in the corn phase. 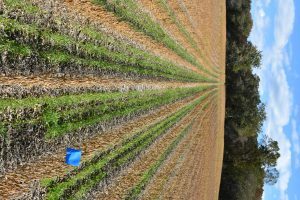 Planting cover crops in a timely manner in the fall to ensure that enough biomass is accumulated to provide the ecosystem and economic benefits of cover crops to the farm and farmer continues to be a central challenge to more farmers adopting cover crops in the Mid-Atlantic region. If this interseeding method is a feasible cover crop planting practice, then farmers stand to benefit from participation in the state cover crop subsidy program as well as decreased spending on nitrogen fertilizer for the following crop. This project has strengthened my interest in developing and techniques for large-scale farming to shift towards more environmentally and economically sustainable methods. The length of each experimental field trial session has allowed me to see the full range of how adoption of this interseeding method would impact a full two-year crop rotation on a commercial farm. Additionally, with the opportunity to run two rounds of these two-year field trials has come the benefit of seeing how the interseeded double crop soybeans and cover crops perform in very different weather and in different locations with different soil types.